Andy Griffth’s career was based on characters that were in some degree a light-hearted parody of himself. Born in North Carolina, Griffith’s parents were so poor that Andy didn’t have a crib or bed and for some time slept in a dresser drawer. When he entered school, Andy was very much aware that he was from the wrong side of the tracks, and there for a shy student. He overcame this when he learned to make his classmates laugh. In high school, he developed a love of the arts and music and was offered a part in the annual production of The Lost Colony on Roanoke Island. Andy appeared in the play for seven years in various roles. He began college studying to become a preacher, but soon changed his major to music. After graduation, he taught music and drama at Goldsboro High School (among his students was Carl Kesssel, newscaster and personality on NPR). While teaching, Griffith began writing and performing as a monologist. One of his monologues, “What It Was, Was Football”, was recorded and released as a single. 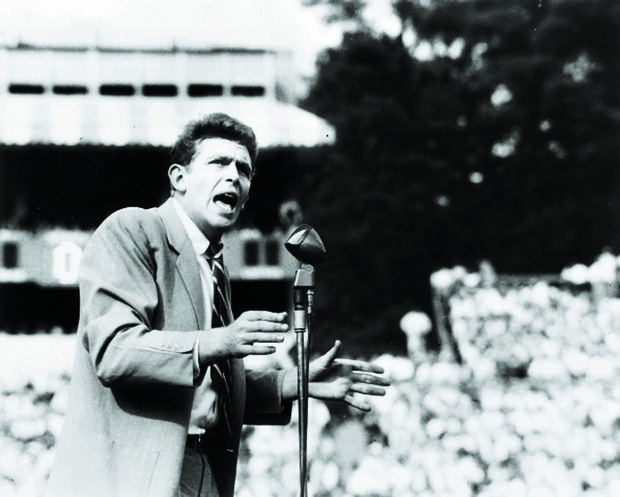 Billed as “Deacon Andy Griffith”, the monologue was the story of a simple country preacher who got caught in the crowd and swept into the stands of a college football game. The game and its quirks are completely foriegn to the narrator, especially “the awfullest fight I have ever seen… in my life!” Deacon Andy Griffth was a guest on Jimmy Dean’s Town and Country Time on AFRS, where the same countryboy character describes seeing the Swan Lake ballet. The monologue recording caught the attention of Ira Levine in Hollywood, who was making a television adaptation of No Time For Sergeants for the United States Steel Hour. The teleplay was adapted for a Broadway production, and the play made into a movie, with Andy Griffith playing the lead in all three versions. On Broadway, the part of the corporal in charge of manual dexterity testing was played by Don Knotts, beginning a friendship that would last the rest fo the actors’ lives. The success of No Time For Sergeants led to one of the television roles Griffith is best remembered for, Sheriff Andy Taylor on The Andy Griffith Show. Sheriff Taylor was the town sage of the fictional town of Mayberry, NC. The program was well loved for eight seasons before Griffith bowed out to pursue other projects, including his own production company. One of the projects was a short lived Science Fiction series Salvage 1, the story of a junk dealer whose dream is to collect the junk left on the moon during the Apollo missions. From 1988-1995 Griffith had the title role in the legal drama Matlock. It could be argued that the folksy country lawyer Ben Matlock, practicing in a very urban Atlanta, gained even more fans than Sheriff Andy Taylor. 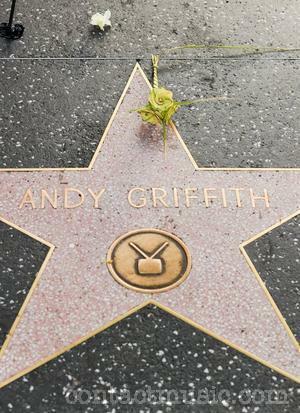 A star on the Hollywood Walk of Fame at 6418 Hollywood Blvd honors Andy Griffith’s work in Television. 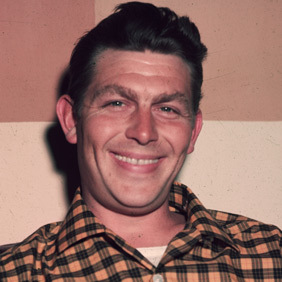 Andy Griffith passed away at his home in Roanoke, NC, on Jul 3, 2012. This entry was posted in Andy Griffith, Obituary, Old Time Radio, Town and Country Time and tagged Andy Griffith, Obituary, Town and Country. Bookmark the permalink.